A Younger Ltd was a high quality British furniture manufacturer that led style and contemporary taste in the 50s, 60s and 70s. Younger furniture was low volume, well made and aimed at the top end of the market. Younger was amongst the first firms to make Scandinavian style furniture in the fifties and one of the first manufacturers to abandon the style in search of something more original in the late sixties. As early as January 1955 Younger marketed their first teak dining suite, Moselle. Two years later, they introduced Volany, a new range of teak furniture which they sold for a further ten years. Younger's top designer was John Herbert, the firm's design director. He won three awards from the Furniture Makers' Guild in 1960 for a sideboard and two tables. All three were similar to contemporary Scandinavian furniture. The sideboard was constructed from solid afromosia, an African wood of similar colour and appearance to teak; manufacturers often used it to complement teak, because it was easier to work. John Herbert veneered the drawers in teak and completed the design with simple, round, wooden handles. The first of the two tables combined teak and rosewood veneers, a combination that was to become very popular later in the 'sixties, the other was made in solid afromosia. In the mid sixties, John Herbert moved away from teak when he designed a new dining set in African walnut for Younger. The firm was indicating a move away from popular taste and pioneering a new direction in furniture. "instead of finding it difficult to purchase a teak dining set - as it was twelve years ago - the problem now is to find anything else!" Younger was ready for a radical departure. John Herbert and his assistant, Alan Pledge, spent a few weeks locked away in Herbert's home in Kent thinking up new ideas. Their new furniture was modern, but had the imposing grandeur of traditional Spanish design. There was a hexagonal dining table mounted on a large central pedestal on a hexagonal plinth. This went with high backed, upholstered, dining chairs which were completely different from anything else on sale. There were grand storage cabinets, 6 ft 6in in length in several, different designs. One had ecclesiastical looking doors with arched windows, guarded by diamond wire mesh. Another had Georgian style paneled doors, with large recessed circles resembling the front door of a grand town house in miniature. Both were mounted on large plinths, with a hint of the classical pillar and a heavy appearance. Younger offered several very different finishes. There was a new wood, louro, from central Brazil, finished in a traditional polish. Furniture with this finish could have belonged to an important Mediterranean official, perhaps someone like James Bond might have visited on one of his missions. Younger also offered an entirely different look to the same furniture by using coloured veneers. They offered red, green or black stains, all transparent so that the grain pattern of the wood showed through. The traditional veneer finish appealed to the older generation; the coloured pieces were for the young. As well as these finishes, there was also a white melamine, painted finish. Younger's furniture from this period was seen in some of the most fashionable middle class houses. There was a small Younger unit in the melamine finish in Cliff Brumby's living room in the 1971 Michael Caine film 'Get Carter'. Brumby's living room contained a role call of design classics from the late sixties. He also had G-Plan's World's Most Comfortable Chair and a Parker Knoll recliner. Younger's new furniture was for the expensive end of the market. It might have looked exciting, but it was out of reach for most people. The fashion for coloured woods did not last. Furniture was an expensive purchase that most people wanted to last several years. Coloured woods might well have been fashionable in the late 'sixties, but people wanted to keep their furniture until at least the late 'seventies and some for the rest of their lives. There were radical new ideas in furniture in the early seventies. In 1970 there was a brief craze for wet-look synthetic upholstered furniture. The fashion did not last for more than a year. In 1971, the novelty of the Earls Court Furniture Show was an early waterbed. Younger introduced several innovative ranges of furniture in the seventies. The most successful was Toledo from 1972. This range borrowed heavily from traditional Spanish style. The popularity of Spanish holidays led to a greater appreciation of anything from Spain. Paella was a popular dish and people had a taste for Sangria. Younger's furniture was not as popular as package holidays though and it remained an expensive and exclusive product. If you are looking for Younger furniture, there is a small, but regular quantity of sideboards and dining tables and chairs on eBay. 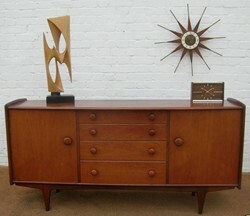 Younger teak sideboards sell for £200 to £400 on eBay. The Toledo range from the early 70s is something of a bargain. You can pick up the storage units for less than £100. Given the quality of the original manufacture this is amazingly cheap. "I am looking to buy a pair of replacement joiners (type of hinge) for my Toledo table. They join the two extension pieces together in the centre and open up when the table is extended and are stored underneath the top when closed. Any help to where a similar fitting might available would be appreciated. "We have one Younger Tolado dark wood 3 draw side board. Extended dining room table that has a centre pull out & the extension is in the centre along with 4 chairs & 2 carvers with arms, which are bespoke & match the table. Younger teak sideboards can sell from between Â£50 and Â£400. Have a look at recent sales on eBay. It often depends on how the item is presented. "Does anyone know where I could get replacement handles for the Younger Jamestown bedroom range? I'm looking for 1 carver chair from Younger's designed by John Herbert made in Afromosia Teak. Can supply photos of the chairs we have if needed. This is to give my Mum a bit more support when she is at the dining table. I have a carver I have just bought and re-oiled using danish oil. It still has the original black vinyl seat. "Looking for a younger 9 drawer bedroom chest of drawers (cherry wood). "Our bedroom suite bought in 1962 (and still much loved) is a George Younger. My memory says it is matt French mahogany / walnut? Veneer on sapele. We paid Â£192 (hire purchase for 6 months. Is it a family inheritance or a recycling challenge? Your advice would be much appreciated. "Looking for a toledo sideboard from 1970s please - as just had a burlglary and they took the cutlery drawers! Also be interested if there were any smaller chests produced . "I have two Jamestown 9 drawer chests in cherrywood to sell. Can you give me an idea of what they are worth. Could supply photographs. "I have a Younger Toledo 3 drawer sideboard for sale. I also have the Toledo dining table...which is in pieces... table base..2 leaf and central extension.. I have a Younger center extendable 6 seater dining table and five chairs (one carver "lost" in Holland). It has been in daily use since I bought it new, I think around 1977, from a furniture shop in Norfolk. I now live just outside Vienna, Austria. I was told at the time of purchase it was applewood and it has lovely apple red and green colours in the almost never used pull up centre section. I cannot find any Younger furniture in this style, (light farmhouse definitly not Toledo) and would welcome any info. (could post photos ?). After 40 odd years of use it now needs the top re-finishing and I do not want it to be done badly or lose its lovely colour. "I recently bought a lovely Youngers Cheval mirror mounted on a chest. I believe it is from the Jamestown range and it was made from a lovely teak or rosewood finish I think. I have tried unsuccessfully to find another online to see how much it would be worth. I have painted it in Ivory white and sealed it. The drawer of its chest looks like 2 drawers with 4 ornate brass handles but when it is pulled open it is in fact one deep drawer. "A Younger Bedroom Furniture Set for sale. I have just purchased a side board second hand and it has a few water stains to the surface and lacks a bit in lustre. Could anyone recommend a product to use to wax or oil the surface? "I have a 6 -8 seater dining table, with 6 upholstered chairs, and a large dresser all in very good used condition, looking for a good home. All Younger, we think cherrywood like a pine but narrower grain. lovely furniture. "We have a Toledo 3 seater settee and matching armchair which was re-furbed about 10 years ago with new Leather Cushions but we would like to get it back to its original design (Draylon - Spanish pattern ?) Cannot find any original pictures. Anyone know where we can see original range? "Looking for a two door Youngers willemsberg (yew but looked like pine) wardrobe. Anyone wishing to sell or know the whereabouts of one. "Hi, I have a younger side unit with 2 doors, 4 drawers and plinth at the bottom. "Offers invited for a Youngers Toledo book case/display cabinet. Dark solid oak.